Working in a team with you, we take into account the individuality of your transaction and aim to reduce risk in order to enable truly efficient action. Our services include project management, coordination of transaction as well as transaction structuring. We support you during the entire transaction. Even after the closing of the transaction, we are here for you. 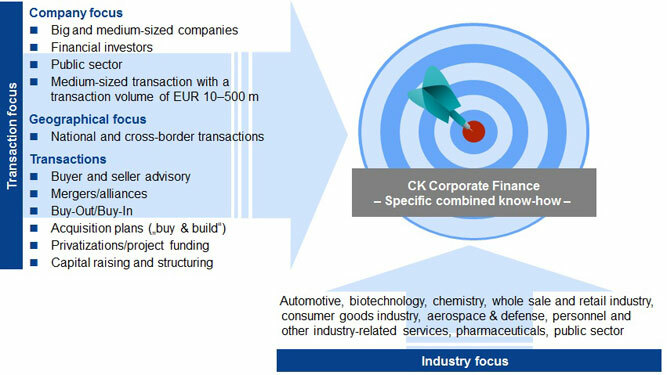 Due to our focus on mid-sized transactions with transaction volume between EUR 10 and 500 million and our expertise in particular industries, we can implement our specific know-how and support you optimally in your transaction. Our main advantage over our competitors is that we are free from conflict of interest. We are a privately held independent company with no credit interest or other cross-selling pressure. As your consultants, we represent solely your interests. We use both our industry expertise together with extensive experience in structuring, implementation and closing of national and cross-border transactions. Combined with our worldwide contacts in the industry, banks and consulting firms, we are able to find the best solution for you. Due to our flat hierarchy there is no time loss caused by internal coordination problems. Our goal and ambition is always to have satisfied customers who would like to work with us on a long-term-basis. Therefore, our solutions always include sustainable success drivers for our customers.